I converted my husband into a Brussels sprout lover years ago. Prior to this he was a “hater”. After roasting them with fresh garlic, kosher salt and olive oil, he was sold. He has never looked back. The key is roasting until the sweetness came out and the “sproutiness” was gone. Converting my children was another task entirely. I started making them with carrots so that the kids would have something that they like. I could get them to eat one Brussels sprout but that was about it. Then I found the maple glaze ideas. Maple syrup is a flavor that is familiar to most kids, and a hint of this flavor roasted into the veggies is a great way to win kids over. Both my kids and my husband were fans. Now most of the time we skip the glaze and use just oil, salt and garlic. This glaze will coat about 1 1/2 lbs of veggies. 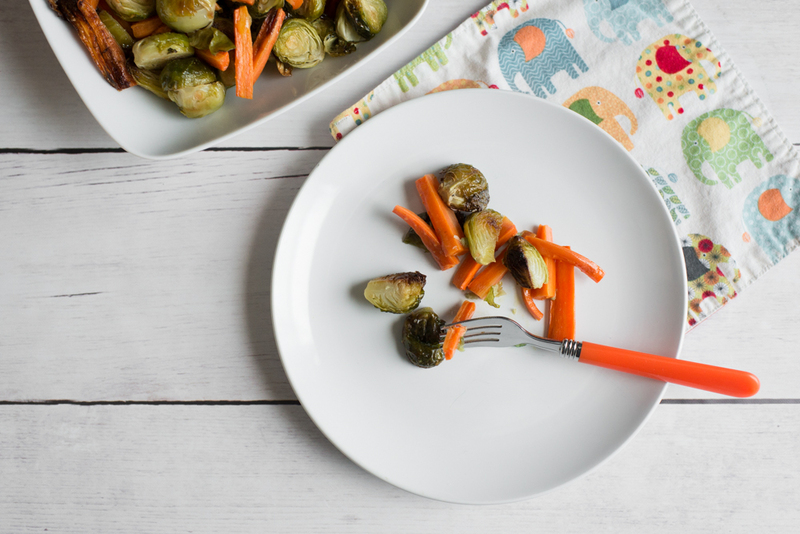 If your kids aren’t into Brussel sprouts yet, you may go more with carrots and then over time, use more sprouts as they get used to them. Preheat oven to 350 degrees and spray 9×9 or 9×13 inch pan with cooking spray. Rinse Brussels sprouts, remove outer leaves and stems and cut in half (or quarters for larger sized sprouts). Place in pan with carrots. Prepare glaze by whisking olive oil, maple syrup and mustard together until blended. Drizzle over veggies and toss to coat. Sprinkle with salt, a little pepper and thyme. Roast for 1 hour or more until Brussels sprouts are nicely browned, giving it a toss after about 30 minutes and checking every 15 minutes to make sure they are not burning.